A pilgrimage in Turkey prompts a reflection on how we learn to preach—and how we encourage others to learn preaching. Now, I invited our pilgrimage group to join me in the footsteps of Paul on his first missionary journey. East of the more famous Ephesus, congested by cruise ship passengers, sits a quiet archaeological site called Pisidian Antioch. It was here that Paul came in Acts 13:13, as an evangelist with training wheels on, to share the gospel. We had the place to ourselves. We walked slowly down the old Roman roads, imagining a passionate yet amateur apostle, feeling his way forward with the help of the Holy Spirit, burning in his desire to share the Gospel with others. Near the end of the walk sat the ruins of an ancient church and the excavated ruins of the synagogue where Paul preached his rookie sermon. In the delightfully loose translation from Turkish to English, the sign boldly declared that place to be the site of “Paul’s First Preach.” I liked that. As I preached in that space to our pilgrimage group, I found myself reflecting on how one gets started in the proclamation of the Word. If you are a preacher, do you remember the first time you preached? Perhaps it started with a testimony in church. Or was your first time when you were put on the spot in the church to give an account of the hope that is within you (1 Peter 3:15)? I still recall my “first preach.” It was a couple of years after my own teenage conversion from the cultural Christianity of my childhood to a passionate discipleship to our risen Lord. My pastor asked if I would take on preaching at a new evening service, led by with our praise band. I was 18 years old—just young and foolish enough to say yes. Those poor, sweet people who showed up in suburban Winnipeg to listen to my “first preach.” Of course, they didn’t show up to hear me, but to encounter the living God in Christ who is revealed in Word and Sacrament. Thank God (literally) for that. Sure, my “first preach” was awful. At least, I would mark it so now as a seminary professor. But that’s not the point. My pastor loved the Word so much that he was willing to risk placing that “Holy Hand Grenade” in the hands of a teenager. Then again, God risked placing the Word in the womb of a teenage girl in the backwater of Galilee. In these curious post-Christendom times, forming disciples who can live and speak their faith into our increasingly pagan culture is critical. 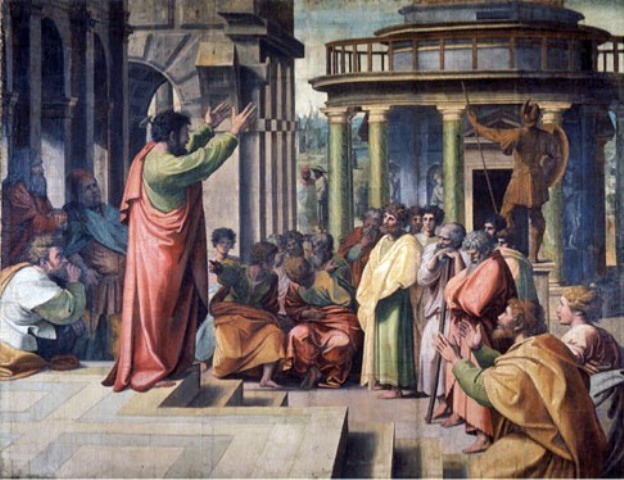 Many years ago, I believed that the ultimate goal of evangelistic preaching was conversion. But today I believe that only to be the penultimate goal. Surely the ultimate goal of evangelistic preaching is that at least some of the converted become evangelistic preachers themselves. These evangelists then help people take steps towards faith in Jesus in the places where they live, work and play. In other words, part of the pastoral leadership we strive to offer today is to enable people, awakened by the Holy Spirit, to find ways to do their own “first preach” with training wheels on. In many ways, this mirrors the objectives of the Missional Christianity movement which continues to bubble up across North America today. Because we are firmly convinced that the church doesn’t have a mission, but that God’s mission has a church, we continue to help make disciples for Jesus who will join God in the living and sharing of the gospel in neighbourhoods they call home. Just as we trust that God accepts us just the way we are, yet has no intention of leaving us the way he found us, so too we strive by the Spirit’s power to become more seasoned and effective in our proclamation of the Word as disciples. Paul’s letter to the Romans is a wee bit more sophisticated than his “first preach” in Pisidian Antioch in Acts 13! With our feet sore, our lips parched, and our hearts full from worship and wonder at Pisidian Antioch, we boarded our pilgrimage bus and continued on our 2,000 km journey to Corinth. But in the days that followed, our conversations returned to that quiet and meaningful space in the Turkish countryside. How might God grant us a bolder vision of speaking about Jesus back home in Canada? How might we testify to the one who is living water in a dry and barren spiritual landscape? How might we help others experience their “first preach” and, in the process of sharing Jesus, be converted again and again by the One who grants life before death and holds life beyond death? Ross Lockhart is an Associate Professor and Director of Ministry Leadership and Education at St. Andrew’s Hall, UBC.